With FileChimp you can easily auto save emails to network folders. 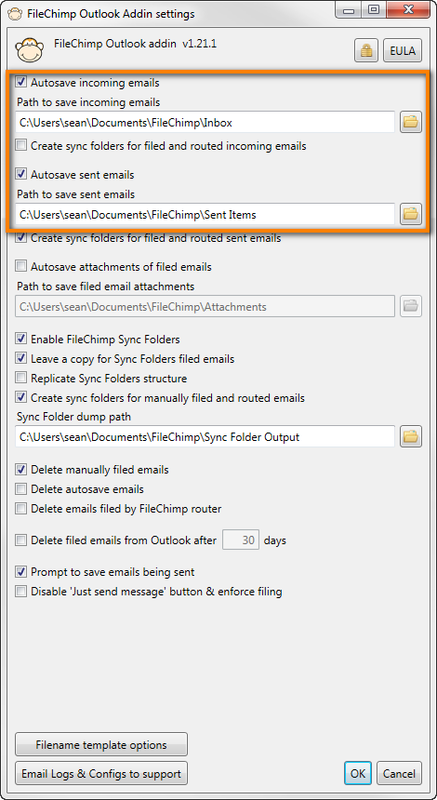 If you need to keep a copy of all incoming emails or sent items you can enable the auto save feature in FileChimp settings. This can be found by clicking the cog icon located on the ribbon menu in Outlook. Locate the Autosave incoming emails and Autosave sent emails options and provide a destination path. A copy of all emails will be auto saved to this path in .msg format. You can also auto save emails into outlook folders. Take a look at FileChimp Sync folders to automatically organise your mailbox. If you want to file the emails into network folders take a look at using the FileChimp application to save emails to network folders based on email addresses, domain names, tags, project numbers or almost any kind of alphanumeric string!